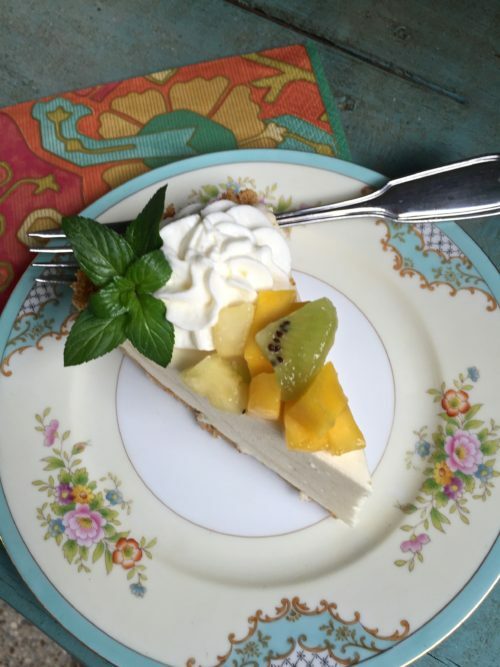 A smooth and creamy pie with colorful fruits. 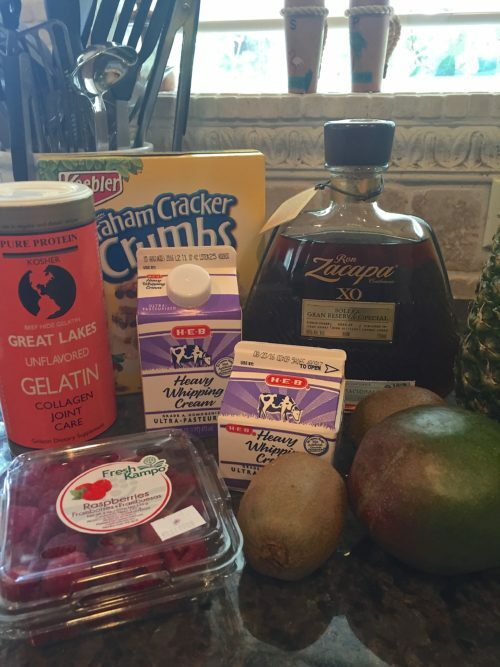 Recently I was looking through one of our book for a particular recipe we both use to cook and decided to revisit our dessert section and when I saw this recipe I thought “ohhh, I forgot all about you” and how creamy and rummy you tasted; and how good you would be with some beautiful tropical fruits. 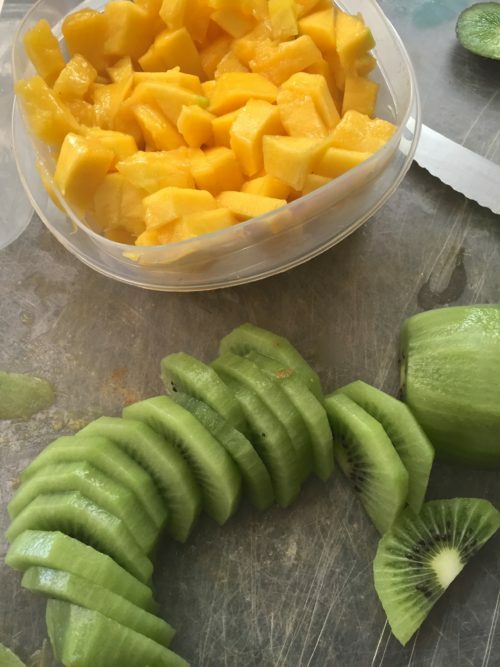 We eat a lot of fruit and I’m always looking for different ones to try but always go back to my favorites which are raspberries, kiwi, pineapple, and mango just because the colors are so beautiful together. My first though on what fruits to garnish this pie with was to use tropical fruits but when I looked up the list of tropicals, raspberries didn’t show up and after making that salsa to go with my Spicy Tuna Bowl that had passion fruit and pepino melon (it was good) I didn’t want to go out on a limb again and try a “new” fruit. Some of those tropical fruits, in my opinion, have soft mushy taste that I don’t care for. Ya can’t go wrong with anything with raspberries, mango, pineapple and kiwi. I’m sure everyone uses raspberries and probably mangos (we get a lot of good mangos here in Texas) but do you buy kiwi often? Did you know that kiwi was first introduced in the US in California in 1962 and by the 1980’s California was producing its own kiwis and sales skyrocketed 667%. Kiwi is one of the top 10 most nutritional fruits. I just love the fuzzy skins and the poppyseed-looking fruit. I know I never had a kiwi in the 60’s, probably the 70’s and I’m not sure if I would have even seen one in the markets in Iowa and Chicago in the 80’s. If I had seen them, I would have not had any idea what it was or what to do with it. How about trying some of that kiwi on small popsicle sticks and dip in chocolate for a kiwi pop. Or, do like I do and look at Pinterest for ideas. If you have extra fruit topping from this pie, try it on top of pancakes for a special treat. Confession: I was making this pie to take to craft circle for someone in my group who was having a birthday. Well, I used the gelatin in picture below (it is suppose to set up) and the pie never set up more than a soft pudding consistency. I couldn’t NOT take a dessert so I took some plastic martini glasses and we scooped up the rummy mixture along with the fruit and enjoyed it that way. I most definitely had to remake this pie because I knew how pretty it was suppose to look. The second time around I used the regular Knox unflavored gelatin and it worked just fine. BLAST FROM THE PAST: Mama’s Butter Cake is a recipe of my grandmothers. 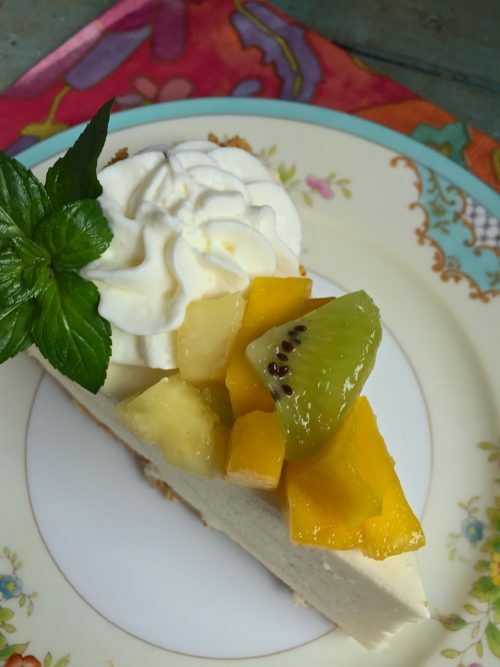 We use to just eat it with some melted butter on top but if you want to make a more traditional shortcake than the one I just posted, then try this recipe or make it and try warm out of the oven with a smear of butter on top. Just a few ingredients for a delicious pie. 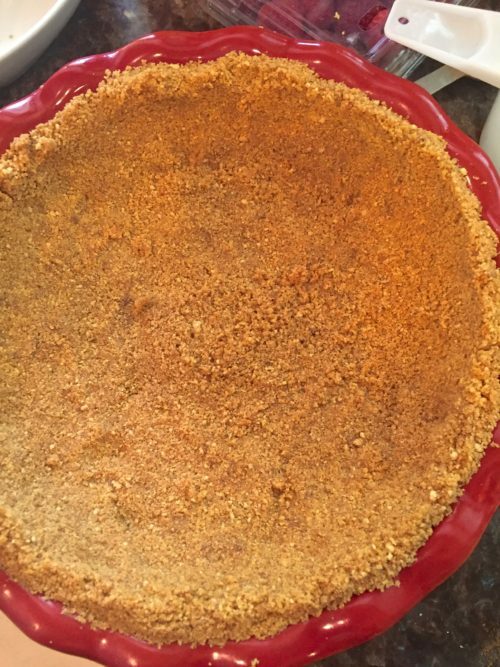 Make your graham cracker crust or purchase a pre-made one. Put the gelatin in cold water and let sit for about 5 minutes. Then heat on stove until dissolved then cool a couple of minutes before adding in with the egg mixture. 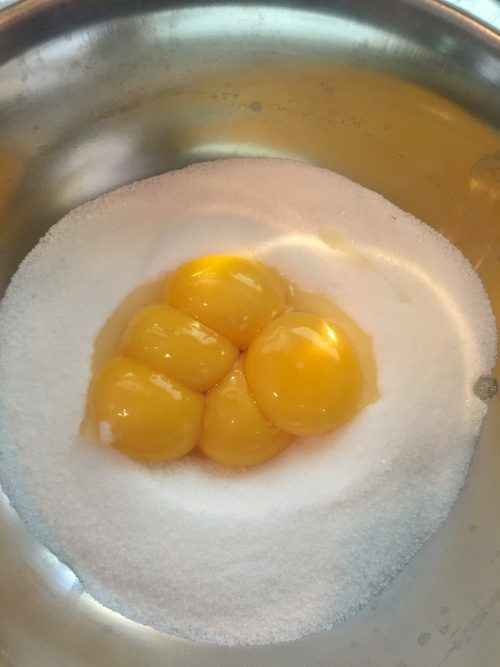 Put the sugar and egg yolks in a bowl. 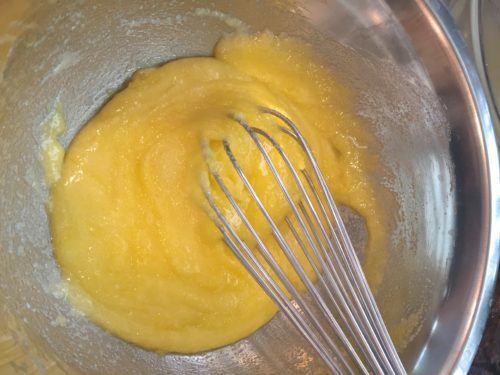 Whisk in the cooled gelatin into the egg mixture. Add the whipped cream to mixture and gently fold in to incorporate and then stir in the rum. Pour the mixture into graham cracker crust and chill 4 hours or overnight until set. Cut up your fruit. I used mango, kiwi, pineapple and fresh raspberries. 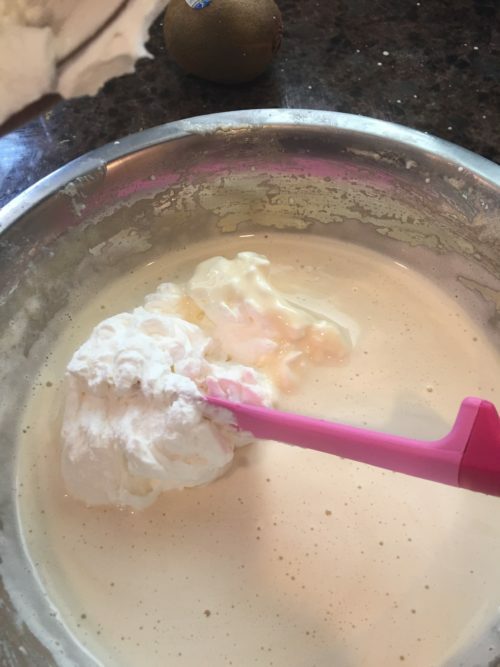 Whip 1 cup heavy cream and sweeten with 1/4 c. powdered sugar. 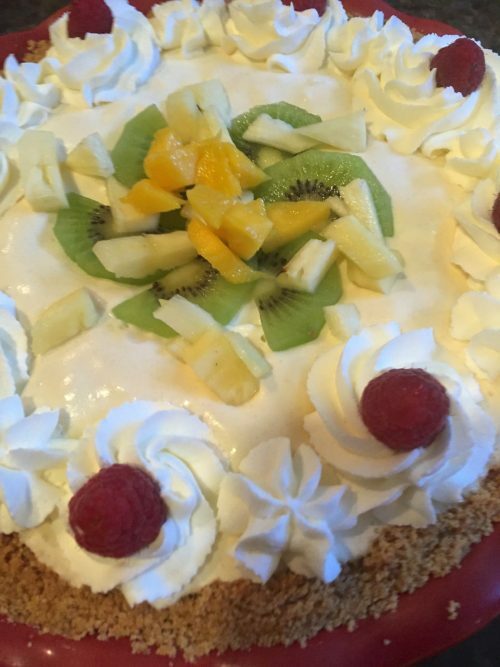 Decorate edge of pie with rosettes of whipped cream, top with fruit and serve. Delicious rum flavored pie with assorted fruits. 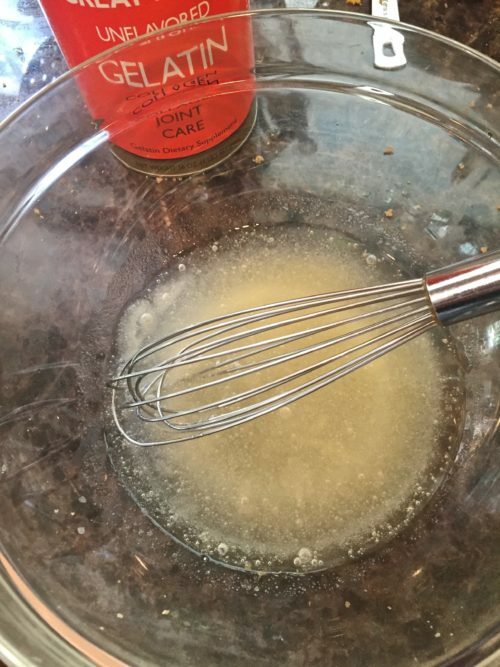 mix the cracker crumbs, melted butter and sugar together with a spatula until combined. Press the mixture into the bottom and up the sides of a pie plate. Bake at 300° for about 10 minutes. Cool before adding the filling. Soften the gelatin in 1/2 c. cold water. Place over low heat and bring almost to a boil, stirring until it is dissolved. Beat the yolks and sugar until very light. Stir gelatin into egg mixture, cool. Gradually add the rum beating constantly. 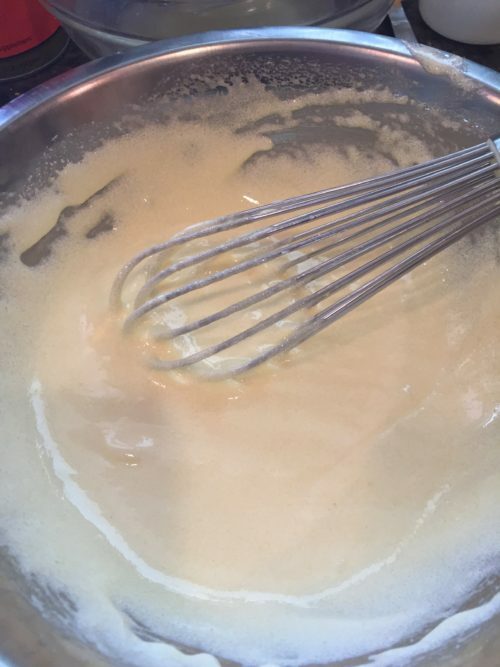 Whip 1 1/2 cup of the cream until it stands in soft peaks and fold into gelatin mixture. Cool until mixture begins to set. Spoon into crust. Chill. Whip the additional cup of heavy cream with the powdered sugar until stiff peaks form. Pipe rosettes of cream around the edge. Garnish with some of the chopped mango, kiwi, raspberries and pineapple. 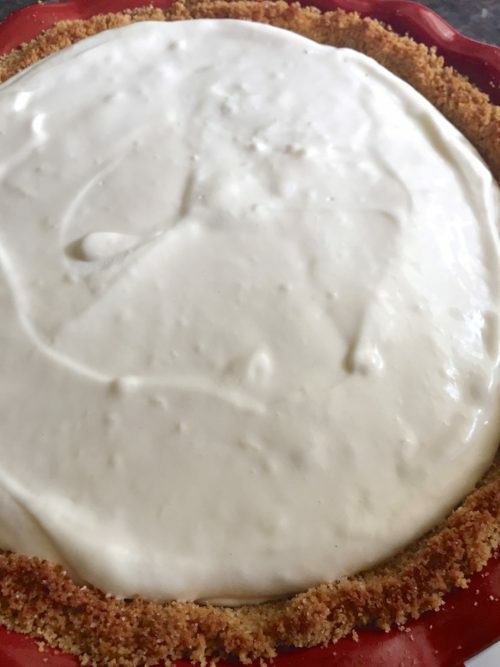 If you don't want to do the piping, just add a dollop of whipped cream on top of the pie with some of the chopped fruit and a little sprig of mint leaves.